Home /News, Research News, Uncategorized/Groundbreaking innovations! In a development that is set to revolutionise the field of livestock management, the Department of Agricultural Economics and Development under the Faculty of Natural Resources Management and Agriculture is in the process of developing a novel method of feeding pigs, which will enhance efficiency and reduce costs. According to the Project Coordinator, Mr. J. B Chivizhe, the innovation, known as the Pig Feed Water Mixer will herald a departure from the use of feeding troughs. In this innovation, pig feed is placed in a drum that has a water tank affixed to the top. The drum has a slot at the bottom through which pigs gain access to the feed. The water tank is triggered the moment pigs access the feed and releases water, which in turn softens the feed. 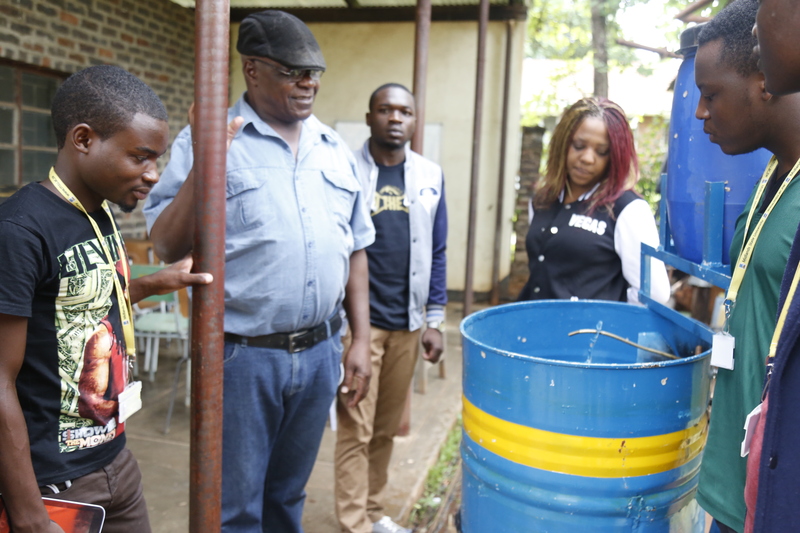 This feeding process, according to Mr. Chivizhe, is much healthier and more economic than the conventional process as the pigs are unable to spill or soil the feed. The Pig Feed Water Mixer is currently undergoing a few modifications and should be complete by the first week of April.